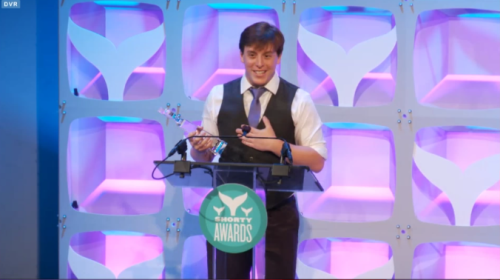 Thomas Sanders won the Vine Star of the Year award for his funny and educational videos that support the LGBTQ community. Photo: ThomasSanders.com. “I hope you enjoy my shenanigans,” is the tagline on Thomas Sander’s Vine account, and by and large, the Internet does. His six-second videos, over 12,000 of them, have been seen over 4 billion times and have gained him 7.1 million followers on the relatively new micro-streaming site. His videos are well-crafted jokes and harmless pranks with broad appeal. Most of them are shallow, just a laugh to share around. But a few hit harder, and they’re meant to. He uses his videos to comment on sexism in school dress codes and fantasy tropes, on disregard of mental health in schools, and on equality. He’s quite open about the fact that he never expected to have the platform he has now. He began making his Vines in 2013 just to share a laugh. But when he saw the reception to his dress-code video in November 2014, he realized that he could be doing more. “It obviously was something that people could have a conversation about,” he said in an interview with MTV. And laughter’s a great way to get people talking. Despite taking on that kind of intent, the young man is still taken aback when people approach him to thank him for bringing up their own important issues. Sanders has frequently been approached by LBGTA+ individuals to thank him for representing them in comedy without ever making their identify the focus of the joke. Teachers have used his videos to begin lessons, and blogging and news sites often use his videos to kick off an article. In the recent MTV interview, he encouraged readers to take their own steps to address important issues with comedy in Vines of their own, but added an important caveat to make sure their research was up to speed, and to be ready to get negative receptions along with the positive. Edit 7/26/16: Redacted an earlier statement indicating that Thomas Sanders is gay, as the statement was made without any factual evidence.